I feel like i'm no longer in the UK, the weather has been glorious and i'm developing a delightful glow. Happy days. 1. Blue and Silver Flats. 4. Tan and Silver Sandals. 1. Black Suede and Patent Sandals. 4. Yellow Strap Peep-toe Sandals. 5. Teal Strap Peep-toe Sandals. I remember when I was younger and used to be taken to Brantano to get my school shoes, I did enjoy those days and would try on shoe after shoe. Now I may no longer need school shoes, but I do need shoes (of course). And the great thing about Brantano is the sheer amount of options and multiple different brands, including Clarks. 1. Tan Knee High Gladiators. 2. Metallic Silver Strap Sandals. 3. Tan Caged Lace-up Sandals. 4. Black with Metallic Trim Strap Sandals. 1. Black Knee High Gladiator. 3. Stone Diamante Strap Sandals. 4. Black Cross Over Sliders. 5. Gold Cross Over Sliders. Every season, without fail, New Look win the shoe game. It is safe to say that 75% of my New Look wish-list is shoes. Affordable prices and a ridiculous amount of variety means there's something for everyone! Awesome picks! Those shoes are amazing!! I love them all!! Great picks! I've been wearing sliders and platforms pretty much every day - I love having a couple of extra inches! I love Marshalls and when I was last in there I almost bought about 4 of those shoes! I need all the shoes you listed! I love that Embellished Sandal. very unique style! 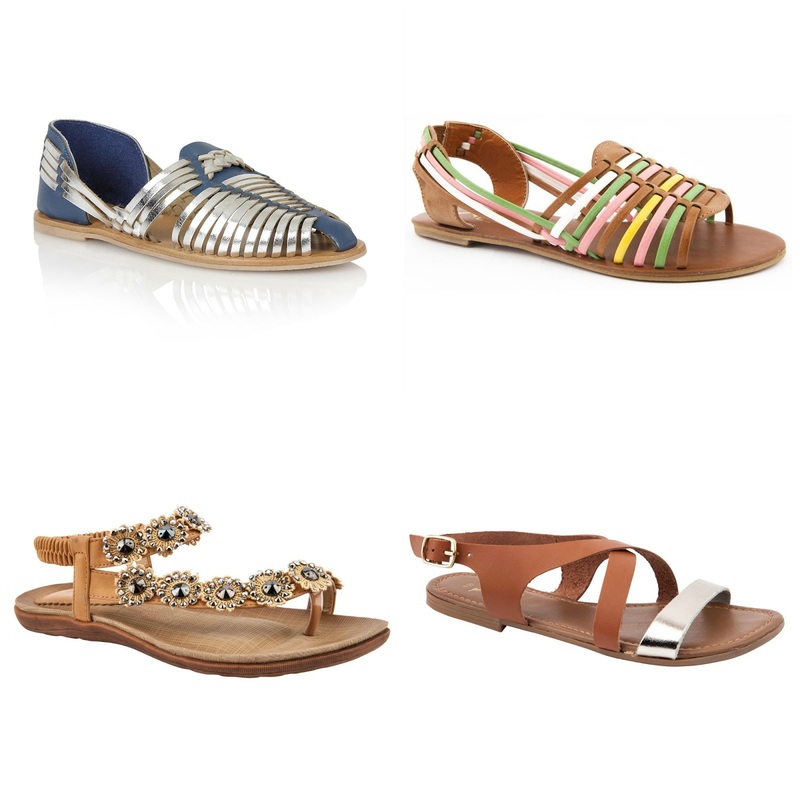 Loving these great summer sandal options! Cool designs! Perfect for summers!! loving the black ones with the little ankle strap! My favorites are the multi-colored sandals at the top, the tan and silver ones, and the tan buckled sandals :) Thanks for sharing! I really love looking at these styles. So many amazing options, but especially loving the first batch of leather sandals. We love how easy they are for summer! Beautiful sandals! Thanks for sharing! I love the gladiators but that would not result in pleasant tan lines. love the 3rd one! stunning embellished pair! Yesss, I've been on a total summer shoe hunt lately! I can't believe all of these are from New Look. Being from the States, my first exposure to New Look was when I was abroad in Paris, and even then, I didn't see too many cute sandals until now ;) I'm absolutely loving the lace-up and the peep-toe sandals.